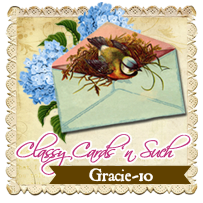 It’s time for a new weekly challenge at Classy Cards ‘n Such: Christmas Blooms. I thought I’d create a smaller card that would look great added to a gift bag. I used Spellbinders dies to make my card. I made some white and red handmade flowers and created a nice Christmas bouquet. I used some pretty label die cuts to create a nice frame for the flowers! 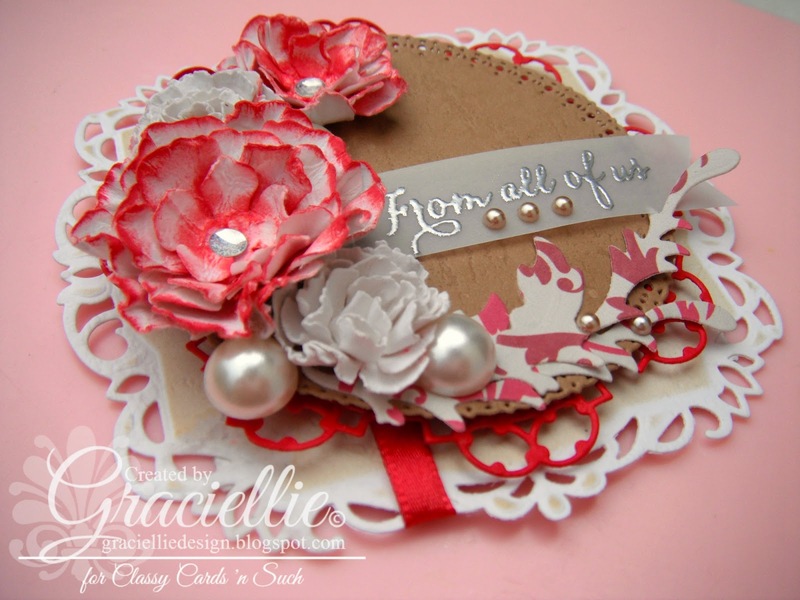 For more on how I created this card please visit Classy Cards ‘n Such! Remember to join our weekly challenge for a chance to win a little prize from the store. Also, I invite you to check out all the new goodies that have been added to the store recently (lots of Christmas supplies)! Use my discount code to get 10% off! Your cards are always so beautiful, but this one is just stunning!!! Wow wow wow!! Love your work!! As usual, a gorgeous card. The flowers are beautiful and I love the dies you used. This is really pretty. I love all the layers and the textures that you used on this. Thanks for joining us at Use your Stuff and hope to see you again. This is absolutely stunning! 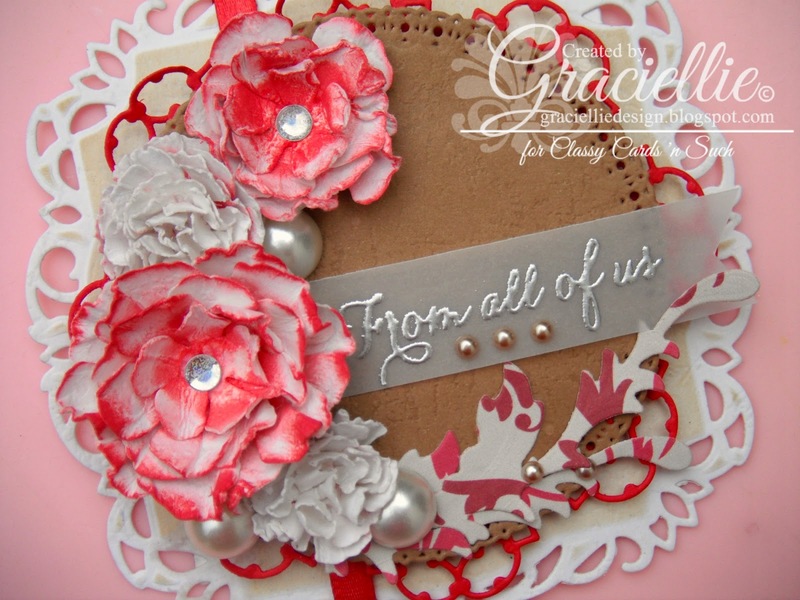 I love the handmade flowers and the layering! The stamping on the vellum is gorgeous as well! Thanks for sharing with us this week at Use Your Stuff – hope to see more of your work! So unique and stunning Christmas card. I love the flowers and the shape of your card. It's gorgeous! 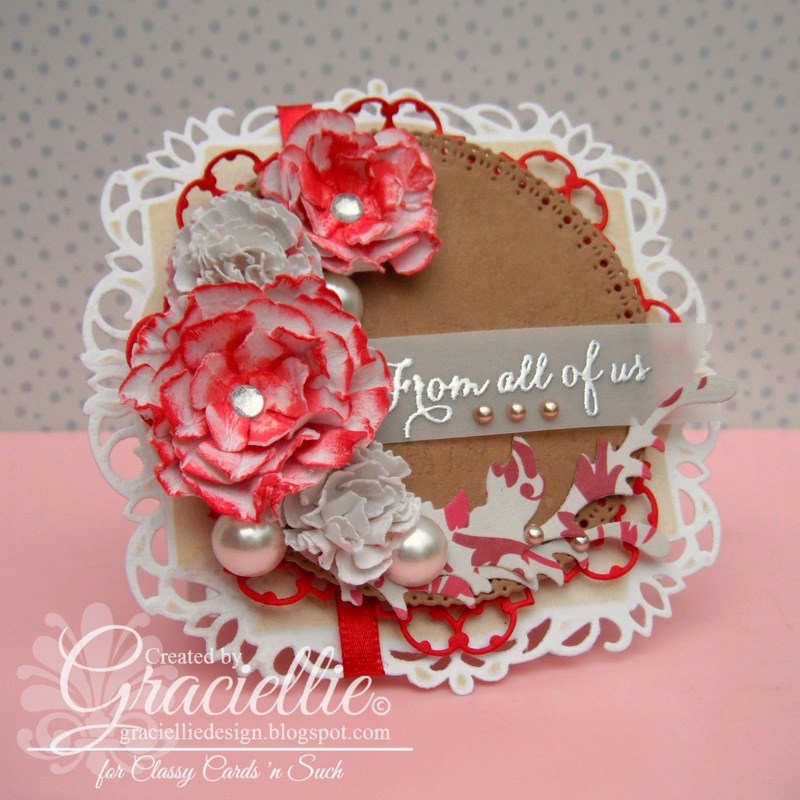 Thank you for sharing your amazing card with us at Stamping Sensation. This is really cute and elegant! Love the layers. Thank you for joining our challenge at Sketchy Colors this week! Lovely card. Thanks for playing at Use Your Stuff!